Rooney's late winner was his first goal in Liverpool's backyard for 11 years and the victory left United only seven points behind Arsenal, who went back on top even though they were held at Stoke. The goal kept up Rooney's New Year hot streak – he has scored five in the first four games of 2016 – and took his Premier League tally for United to 176, more than any other player for one club, overtaking the previous best of 175 by Thierry Henry for Arsenal. 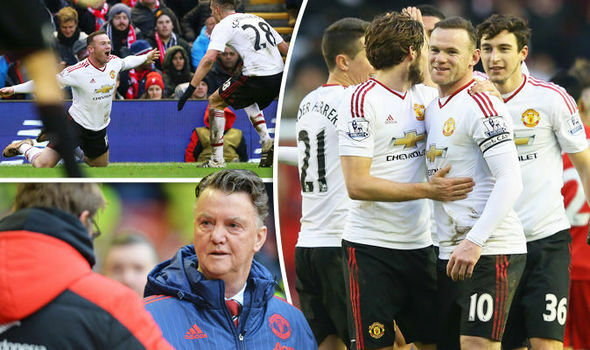 United manager Van Gaal said: "To beat Liverpool is always important. Today it was even more important because our competitors have lost points. "Of course I'm looking at the title. We are seven points behind Arsenal, we have a lot of matches still to go and we have started 2016 very well. "This game will give a big boost to the players and the fans and the environment of Manchester United. It is good for us and good for our position the table." Rooney, who missed a penalty in last season's corresponding fixture, was delighted to have scored at Goodison Park and Anfield in the same season for the first time. He said: "It was massive victory for us and continues our good start to this year. I didn't know about the record but that's not what I'm feeling now. "To score the winning goal at Anfield has been a long time for me – since my first year at United – so I'm going to be a bit selfish and enjoy that the most. "This is a special feeling, obviously. It is always great to score at your rivals and, against Liverpool for this football club, it is a massive result. On a personal note it doesn't get much better. "For my goal, I know Simon Mignolet is a very good goalkeeper and there were players trying to cover, so I just tried to put my foot through it and take whoever was in the way with it! Thankfully it went in and won us the game. "Today the performance wasn't that important – the result was all that mattered." Liverpool manager Jurgen Klopp was frustrated by his team's failure to take several chances and continured vulnerability against set-pieces. He said: "It's frustrating because there were many things that were good, but our finishing was not good, because we should have scored a goal. "United will be happy. You can talk about their performance and it wasn't that good, but they can be happy. "We made three mistakes for their goal and against a team of United's that's too much."